Every year brings changes into our lives, but then at the end of the year, on Christmas we are brought back to the old story that never changes: “For unto you is born this day a Savior, who is Christ the Lord.” I hear those words and my mind goes back forty-five years to Sunday School programs and Christmas Eve candlelight services. I can’t hear that old story without thinking about Christmases back then when things were so much simpler. Jesus said, “Unless you become like little children, you will not enter the kingdom of heaven.” At Christmas we can feel a bit like little children again—hearing the familiar old story and singing the old favorite songs about a Savior born for me. We even see that things really can be that simple again. When I was a small child I trusted my parents for everything. Life was simple because it was all in their hands. And now, by faith I can trust my heavenly Father in the same way. It is all, still, in the good hands of another. The questions and cares and troubles of life remain. Things are always changing, and oftentimes it is in ways we don’t want. I was talking to a friend of mine after a year of several heartbreaking changes in his life, and he said to me over and over again, “Why can’t things just go back to how they used to be?” There were too many changes for him that year. We all feel that way sometimes, perhaps even much of the time. But in the Christmas story we learn that what really matters never changes, because in that story we find our future story with a promise of a time and place that there will be no more unpleasant changes. This can be our anchor and stability amidst all the changes. We have a Savior who will restore all that has been lost. My friend wished things could go back to how they used to be. The coming of Jesus opens up for us a future far better than anything we have ever experienced in our past. Until then, the changes will continue. Who knows what we will yet have to endure, even in this coming year? You and I may not even be alive to hear the story next Christmas. But we need not live our lives in fear of change or even death, because we have a Savior, and that will not change. August Stier, my great-great grandfather, experienced in 1875 an extraordinary year of change. The biggest change was leaving his home in Germany to emigrate to Minnesota late in the summer. From then on everything would be different. There would be a new community of people to get to know, a new way of farming with land to clear and fields to plow, a new language to learn, and a new wife, with which to share life in his new home. But just a few weeks after he arrived, he gathered with other Christians in a little country church to hear the same story he heard the previous Christmas on the other side of the world. That much was still the same. In the years to come he would go through many more changes, including that biggest change of all, death. His death was almost 100 years ago, and now, all that August has left is the promise of that Savior of whose birth he heard each year. God’s loving care of him has not changed. It is still there for him. Jesus still has a hold of my great-great grandfather, and won’t ever let him go, and will one day raise him from the dust of the earth. Jesus stays with us. He holds on to us. That will never change. 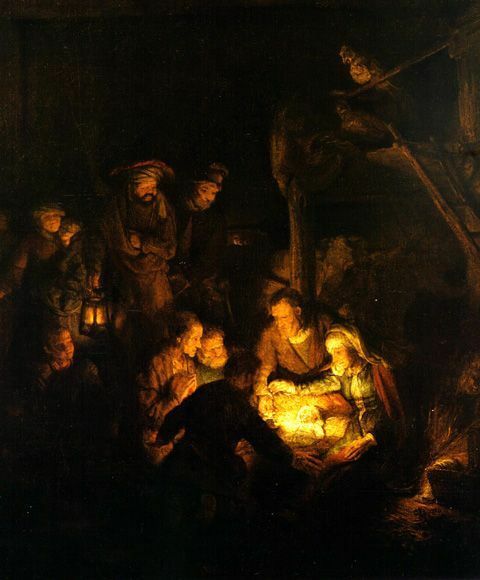 Luke 2:11 — For unto you is born this day in the city of David a Savior, which is Christ the Lord. I Corinthians 15:52 — In a flash, in the twinkling of an eye, at the last trumpet. For the trumpet will sound, the dead will be raised imperishable, and we will be changed. ← 1347) What Are the Unchurched Thinking?